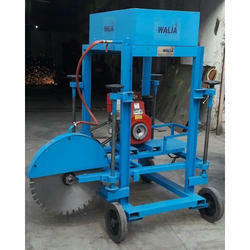 Being a customer oriented organization, we are deeply engaged in offering a wide array of Kerb Cutter. Being one of the renowned organizations in the industry, we are highly engaged in manufacturing a premium quality array of Curb Cutting Machine. Gained importance in the industry as an eminent company, we are offering Curb Cutting Machine, which is delivered in recommended time frame. - Manual , semi-automatic & fully automatic machines are designed for highest speed & maneuverability. - Blade Sizes: 500 mm (20) dia to 800 mm (32) dia. Ensured over their eminent serving life and increased robustness, we deliver with a very hard weary and heavy duty assortment of Curb Kerb Cutting Machine made in surveillance of individual quality parameters. Our motto is to outshine amongst our clients by providing them with high quality range of Concrete Kerb Cutting Machine. Offered range is mainly used in construction industry, thus is designed by keeping in mind their requirements. 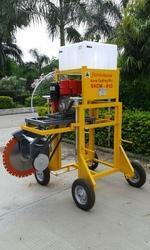 Concrete Kerb Cutting Machine is simple in handling and operation and has long service life.